Dublin, Ireland is a modern European capital city. Traffic snakes bumper to bumper with glass towers rising up around it. But that’s only the surface. Stop. Look closer. History waits at every step. Some sights are iconic. You see them replicated on a whole range of Irish gifts. The Guinness complex. The Four Courts and the Custom House. The GPO has a starring role and an unmissable spot on O’Connell Street. But there is another layer beneath that. Dublin is a Viking city. In fact, the city is home to the new VikingFest, scheduled for March 30th – April 2nd. The festival will be held at Wood Quay, site of Dubinia, the city’s Viking museum. And with eerie timing, archaeologists working at the site of a new hotel in the nearby Coombe neighbourhood just found a trove of Viking artefacts. Three troves, really. They discovered layers of artefacts: a top layer of items dating to the 17th and 19th century, a middle layer with things from 13th and 14th centuries and a bottom layer 2.5 meters below ground offering up treasures from the 10th to 12th centuries. The archaeologists have uncovered nine structures in four distinct plots so far, mostly mud and wattle construction, believed to date to the 1100s. Some were houses and others sheltered livestock. The items found give us some fascinating insight into our ancestors and how they lived. Some things were mundane and timeless, such as a wooden spoon and bowl. Others feature compelling designs and invite us to imagine how the Vikings saw their world. 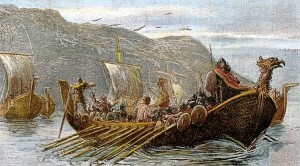 The first Vikings to arrive in Ireland landed in longboats in 795 AD. They came from Norway, and later waves of Vikings came from Denmark. While they looted and took many treasures away, they also left plenty here. The National Museum has a breath-taking collection. This recent find includes some wonderful pieces too. Perhaps the most compelling is a tile with an etching of a man on horseback with a shield. He is brandishing a sword and a bird sits on his head. The image is surrounded by other lines and shapes, including another bird and something that might be a fish. A rare copper alloy key was another exciting find at this site. A coin decorated with a cross and dots filling each quarter of the circle was also among the items unearthed. The items found in the Coombe will become the property of the National Museum of Ireland, and the hotel is debating how to best honor this find. Perhaps someday these images might be popular motifs for Irish gifts! Dublin is full of reminders of our Viking influence, from the Viking Splash tours to the minimalist long boat sculpture on the quays to the Dublinia museum. The Vikings came in waves, and while they arrived as invaders, they settled down and integrated into Irish society. Who knows, perhaps we inherited our propensity to travel and settle around the world from our Viking ancestors.